We've featured action figures that pay tribute to some cultural icons like Edvard Munch, Vincent Van Gogh and Frida Kahlo. But now comes a new action figure that honors a less appreciated cultural force--all of the great librarians, those crusaders for the printed and electronic word, who "keep it all organized for us and let us know about the best of it." 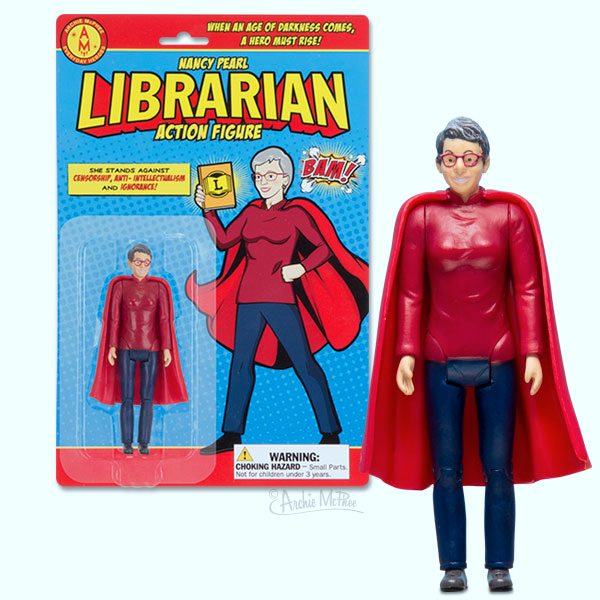 Standing almost four inches tall and made of hard vinyl, the librarian action figure is based on Seattle librarian Nancy Pearl. She has "a removable cape that symbolizes how much of a hero a librarian really is." The action figure should come in handy in your own fights again anti-intellectualism, censorship and ignorance. Enjoy! Isn’t it time for a new librarian rather than one that has recycled the stereotype for 13 years? Maybe a person of colour? Rather than diss a perfectly acceptable facsimilie of a real life advocate of all things a good librarian does…why not add characters to the family. e.g How about an S R Ranganathan figurine for a start? I nominate this guy. He fits the above criteria, and he’s a real-life defender of the library’s sanctity.